Forgive me if I missed it, but with this brewer do I still add nettles/comfry etc or just the ingredients in the packets? Just the ingredients in the packets for this one. A little bit of nettle/comfry could certainly be added for the benefits they bring, but I wouldn’t want to deviate too much from the standard recipe. 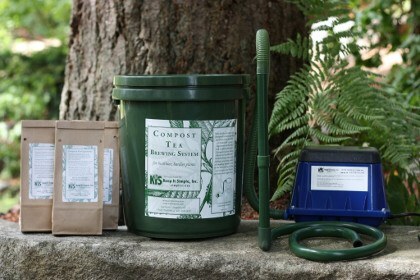 Ok thanks – what’s the best plan then to turn my bucketfuls of nettle&comfry into sweet compost tea??? !do you have an online class? can you share the link? thanks! Hi Sandy, I’ll open it up for enrolment for a few days in October. What are your thoughts on Stihl sprayers for compost tea? Could be good. In general, we want the tea to go through as little filtering as possible, so not too many fine screens and small holes to go through – just enough so that the sprayer doesn’t clog. I had picked up the solo sprayer from Lee Valley last summer and it was a bit flimsy, so I returned it. I thought about getting the Stihl sprayer but I wasn’t sure if there was too much pressure or that the nozzle was not going the be appropriate for compost tea, and only useful for chemicals. 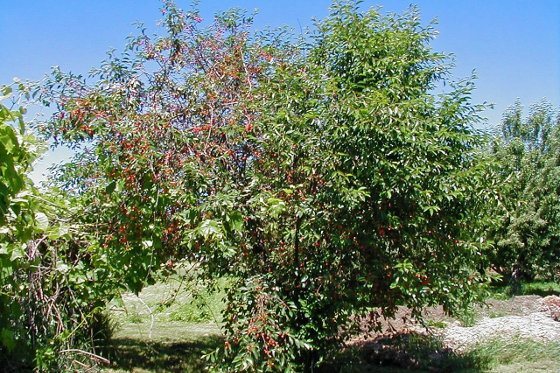 Is there anything you need to do to modify the Birchmeier to spray compost tea? Some people go so far as to take out the filters (which means you’ll want to strain your tea very well), or replace them with 400 micron filters from a hardware store in order to make sure more of the biology gets through – takes a bit of work, but not too bad if you have the parts diagram that comes with the machine. It’s worth the effort. Another sprayer I really like is the Chapin 1949 Concrete Sprayer. Their customer service is awesome and it’s designed to handle large particulate. We use ours around the Farm all the time. Thanks Tad – good to know. Is a sprayer necessary in applying the compost tea? Can I just use an old-fashioned watering can? 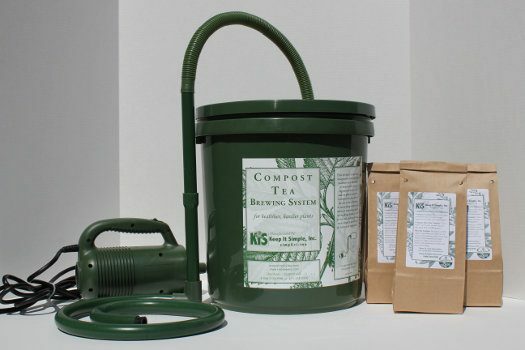 Absolutely, a watering can even has the advantage of causing less harm to the microbes. In order to apply it to the leaves, it’s nice if it has an attachment to turn the water into a coarse mist/fine shower. Hi! I received the brewer a few days ago. Very excited to begin! Still cold here, though. 20F to 45F. Instructions say to use it indoors, so I need to find a spot for it. I have no shed, barn or garage available but there is a small basement, and spare room/studio. 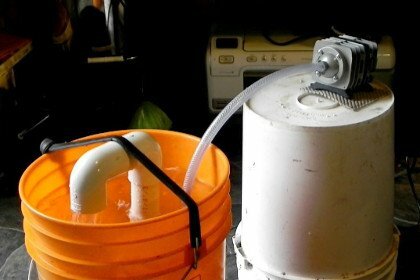 I want to do a test run with water only. Sound reasonable? I want to check noise levels before deciding which space to set up. You can certainly use it outdoors when the weather’s good, although if your neighbors are close, they may not want to listen to it, although covering the whole thing with a big box does help. And yes, no problem testing with water only – you can even leave the water in the bucket for when you’re ready to do the real thing. Just bought your tea brewer kit. Instructions say: Add Simplici-Tea, compost, and molasses–how much molasses do I add? No quantity is given! Also, inside the paper bag is a mesh bag of compost (I assume), and a separate ziplock bag–what is inside the ziplock bag, is it the Simplici-Tea? The ziplock bag is not labeled, and the outer paper bag does not mention Simplicity-Tea, only that it contains ‘Compost & Microbe Catalyst Ingredients’. Your labeling and instructions could use a few edits to clear up these questions! 1) How much molasses do I add? 2) Is the Simpici-Tea inside the ziplock bag, and do I put that inside the mesh bag or loose in the water for brewing? If loose in water, won’t that clog my sprayer? 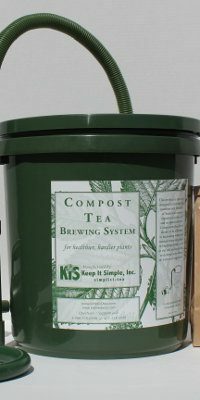 Thanks for your help in brewing tea with my new Simplici-Tea Compost Tea Brewer. 1. Make sure you have dechlorinated water or have treated the water. 2. Drop in the mesh bag that contains the compost (biology) with the brewer running. 3. Sprinkle in the contents of the ziplock bag. Apologies for any confusion, let me know if I can answer any other questions. Phil, item 3 in your response….should that be to sprinkle the contents of the ziplock bag? Thank you for your response. I will ignore the Compost Tea Brewer’s instruction sheet (#7) that says to add molasses, and assume that the contents inside the ziplock bag is the ‘starter food’. Glad to hear that the manufacturer will revisit his instruction sheet and bag labeling to clear up confusing information. Thanks for all the useful info, I’ll be getting my kit soon.